** I recommend to watch the video before playing the game, in order to familiarize with the control scheme. 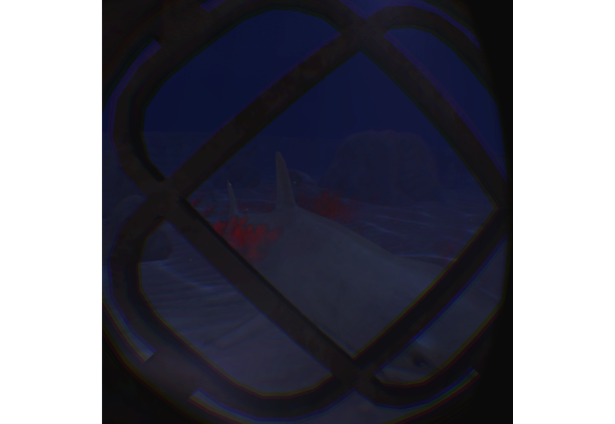 In Apnea you are a deep sea diver who has to cross a scenario infested by sharks before running out of air. Equipped with no more than your claustrophobic helmet, you need to demonstrate intelligence and stealth skills in order to survive... but there is a big catch: The controls. In order to move around you really need to walk (on the spot is ok) and the strength of your steps is mapped into the VR world. So if you need to run or take little steps you truly have to. Be careful! Noisy steps will alert the sharks nearby so be clever about when to run and when not to move at all. Apnea uses the microphone attached to the earphones to detect your real breath as well! Everytime you exhale, bubbles will come out and your O2 tank will lose valuable oxygen. The stronger you exhale the more you will lose so keep your breath in control if you want to make it to the end..... and specially if you don't want curious sharks around you thanks to the bubbles! You need to find the exit of each level before running out of air. In order to succeed, you must use tall sea-weed zones to hide and catch your breath, study the sharks' movements and investigate the area around you before starting to move. Remember you are a deep sea diver so your movements are slow and going down a slope does not always means you will be able to go back up! With Apnea I am trying to unleash the freedom that a mobile-VR-hmd provides. Detecting the locomotion of the user realistically usually involves extra expensive hardware and installation, but with Apnea the user just has to wear the Gear VR and walk around! Even walking on the spot works and since the strength of the walking is detected the user feels immersed with this intuitive controls on the first go. In order to keep correlation to the maximum I also implemented a breathing system that will give feedback every time the user breathes. Thus the sense of actually being underwater is highly improved and also provides a lot of fun with the gameplay design. Furthermore, to keep things as realistic as possible I decided to remove all the GUI on the game (apart from the eventual credits, calibration... but I already have plans to get rid of those in the future as well). In "real life" there is no GUI so why in VR? This rule motivates also the player to use common sense: discovering the controls, if the user breathes too much the screen starts to steam (indicating low O2 levels), using tall sea weed to hide, stronger steps have a higher pitch... Apnea does not hold the player's hand but gives enough feedback for him to discover all the game features. The choice of making an underwater game was not fortuitous. I wanted to do a game in VR that feels natural and establishes a real link with the player. 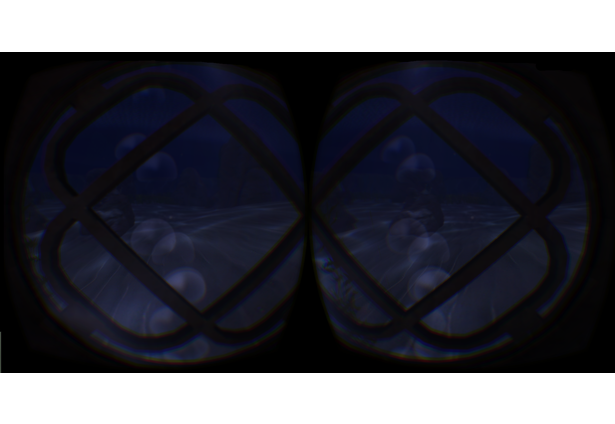 Setting the game underwater allows me to justify a big helmet so the user cannot see his (unexistent) VR body, or the fact that the movements are a bit slow underwater so the user does not get sick. Walking controls, detecting the residual noise in the hmd accelerometer. It can detect long/short strong/weak steps and give feedback accordingly. This game should be played with earphones. To move around just walk naturally (if you are walking on the spot make sure you have a relaxed pose so enough acceleration is translated to the head). You can walk slow or moderate/fast and will receive sound-feedback of your steps. Even thought the mobile embedded microphone should work, for a perfect experience tape the microphone attached to the earphones right under the nose, with the little hole pointing directly to your nose. Everytime you exhale you will see more/less bubbles coming out in front of you . Hold the touch pad during more than 2 seconds and release to re-calibrate the microphone (recommended at the start of the game). The game will ask you to hold your breath during 6 seconds so it can detect the noise around you, after the calibration exhale to test that the process was successful. Many many special thanks to the guys from Popup Asylum: http://popupasylum.co.uk/ who have provided for free their incredible assets (available in the Unity asset store) as well as their continuous support! 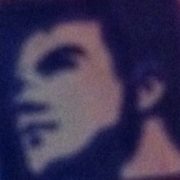 Check their great games! Comments for this submission are closed. View the software in MephestoKhaan's portfolio to continue the conversation.